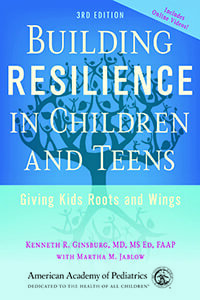 Pediatrician Kenneth Ginsburg specializes in building resilience in kids. He believes that if we want our children to experience the world as fully as possible—with some of its pain and all of its joy—they need resilience. Dr. Ginsburg developed the 7 C’s model to provide a practical approach for parents and communities to prepare children to thrive. Competence is the ability to handle situations effectively. It is not a vague feeling that “I can do this.” Children become competent by developing skills that allow them to trust their judgment and make responsible choices. When we highlight what young people are doing well but also give them opportunities to acquire new skills, they feel competent. We undermine competence when we prevent young people from trying something new—and from recovering on their own if they fall. Encourage children to focus and build on their strengths. When they handle a situation capably, acknowledge what they have done well and how that will affect others and themselves. Let children make safe mistakes so they have the opportunity to right themselves. Avoid trying to protect them from every stumble. Lectures are too complex for young children to understand and too stressful for teens to hear. Instead, break down ideas one step at a time so they can truly understand your points and feel ownership over the lesson they learn. Confidence is the solid belief in one’s own abilities. It is not built by telling kids they’re special or precious. Rather, children gain confidence as they demonstrate their competence in real situations. When parents support children in developing competence, kids believe they can cope with challenges and gain the confidence to try new things. They trust their ability to make sound choices. Instead of focusing only on achievements, encourage the development of personal qualities like fairness, integrity, persistence, and kindness. Praise children honestly and specifically. Rather than “You’re a great artist!” say “I love the colors you used in that painting. Look at the bright red and blue birds!” Specific praise is more believable, and your feedback will have more impact. Encourage children to strive for goals that you think they can achieve but are a bit beyond what they’ve already accomplished. One of the most protective forces in a child’s life is your unconditional love. Empathizing with kids’ positive and negative emotions helps them feel known, understood, and adored. This emotional safety net gives them the foundation they need to express their feelings and work out solutions to their problems. Connections to civic, educational, religious, and athletic groups can also increase a young person’s sense of belonging and safety in a wider world. Allow children to have and express all types of emotions. Don’t encourage them to suppress unpleasant feelings. Show that relationships matter by addressing conflict directly. Work to resolve problems rather than letting them fester. Encourage children to develop close relationships with others. Set an example by fostering your own healthy relationships. Every family has its own idea of what constitutes good character. Whatever the specifics, children need a fundamental sense of right and wrong to ensure they are prepared to contribute to the world and become stable adults. This is character. It helps children become comfortable sticking to their own values and demonstrating a caring attitude toward others. Talk to your children about how their behaviors affect other people in good and bad ways. Encourage children to consider right versus wrong when making choices. Help them look beyond immediate satisfaction or selfish desires. When you make decisions or take actions, express out loud how you think about others’ needs. Work with children to clarify and express their own values. Be a role model. Your actions speak louder than your words. It‘s powerful when children realize that the world is a better place because they’re in it. They gain a sense of purpose by seeing the importance of their contributions, and this can motivate them to take action to improve the world. They also learn that contributing feels good and is driven by a sense of commitment and responsibility, not pity. This may help kids feel more comfortable turning to others for assistance without feeling shame. Communicate to children (at appropriate age levels) that many people in the world don’t have as much money, freedom, and security as they need. Teach the important value of serving others. Model generosity with your time, energy, and resources. Create opportunities for children to contribute in a specific way, like volunteering. Children who learn to cope with stress effectively are better prepared to overcome life’s challenges. Kids who can distinguish between a crisis and a relatively minor setback can avoid unnecessary anxiety. A wide repertoire of positive, adaptive coping mechanisms can also help kids steer clear of dangerous quick fixes for stress. When they’re in crisis, strategies like exercising, giving back, practicing relaxation techniques, and sleeping and eating well can offer relief. Assist children in understanding the difference between a real crisis and something that just feels like one in the moment. Model step-by-step problem solving. Avoid reacting emotionally when you’re overwhelmed. Demonstrate the importance of caring for your body through exercise, good nutrition, and adequate sleep. Practice relaxation techniques. When children’s decisions affect their lives, they learn that they have control. They see that they can do what it takes to bounce back after challenges. If parents make all the decisions, children may believe things happen to them rather than because of their choices. Children who lack a sense of control feel like their actions don’t matter. They can become passive, pessimistic, or even depressed. But resilient children know they have internal control. They know they can make a difference. Encourage children to recognize even their small successes so they know they can succeed. Reward demonstrated responsibility with increased freedom. Remember that the word “discipline” means to teach, not to punish or control. The 7 C’s emerged from the positive youth development movement. Rick Little and colleagues at the International Youth Foundation first described four C’s to ensure a healthy developmental path. They later added “contribution” because young people with these essential four characteristics also contributed to society. Ken Ginsburg added the final two C’s. He is the author of Building Resilience in Children and Teens: Giving Kids Roots and Wings and Raising Kids to Thrive: Balancing Love with Expectations and Protection with Trust, both published by the American Academy of Pediatrics. You can find out more about his work at fosteringresilience.com.